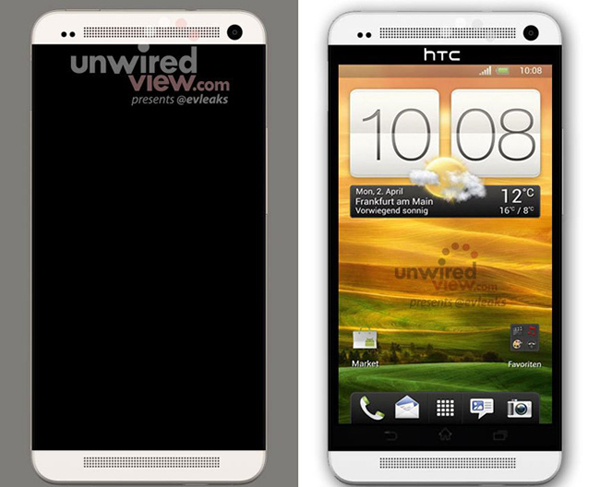 HTC's rumored flagship Android smartphone to replace the One X, dubbed the M7, looks awfully similar to the iPhone 5 only that the similarities are flipped around. The leaked image is sourced from Evleaks, a known and reliable source that we've seen leak numerous products in the past ahead of their official debut which have all turned out to be 100% accurate. So it's safe to say that we're looking at HTC's new 4.7-inch M7 flagship Android device which is expected to make its world debut next month at the Mobile World Congress exhibition in Barcelona, Spain. We've always had great admiration towards HTC's brilliantly designed handsets, more notably the company's recent Windows Phone 8X and 8S outings. The M7 is quite the looker nonetheless. As for some specs, it'll have a 4.7-inch full HD display at a staggering 468ppi with a blazing fast 1.7Ghz quad-core processor, 2GB of RAM and a 13-megapixel camera with a f/2.0 aperture - all housed inside a "premium" build, and a suggested unsubsidized price tag of $600 for a 32GB flavor.